You’re on Funny Anniversary Wishes, page 5 of 9 – Anniversary Wishes and Quotes. Inserting some humor into situations can add fun with these funny anniversary wishes. Below are some funny anniversary wishes that might work for you. Use your discretion. You might start with a funny line and move to something more serious. We’ve sorted these messages into categories to make it a little easier to read and review. Let’s keep making memory after memory together; even though you’re losing yours. Happy Anniversary to the best first husband I’ll ever have. I’m completely not sick of you yet. Through thick and through thin? I used to be thin and now I’m thick, but I still love you more than ever. Congrats on our anniversary. We go together like “copy” and “paste.” Happy Anniversary Baby! We have a love-hate relationship – we love one another and hate to be without each other. I’ll follow you wherever you go my Love. To say I fell hard for you is an understatement. I still love you now more than ever. You’re Bogie and I’m Bacall. Happy Anniversary Sweets! WARNING: As always, use these wishes at your own peril. Remember the “Hell hath no fury…” quote. Please note, we don’t have your backs. You’re on your own. Ok, so most of our candlelight dinners are when the electricity goes off. But, you still keep me charged every day. Love you and happy anniversary. Another revolution of the earth and you still have me spinning head over heels in love. Congratulations on our Anniversary, Lover Boy! God proved his sense of humor when he matched you and me together. He also proved His genius. Three cheers, we made it another year hubby! They said a love like ours would never last. What do they know? Happy Anniversary! Ok, after all these years, we have it figured out: You wear the pants and I control the bank account. Happy Anniversary! Peanut butter and jelly are not a finer match. Cheers to our Anniversary! Three kids, two love birds and one mortgage — We’re in this together. Love ya! Marriage means commitment. Of course, so does insanity. Let’s celebrate while we can – happy anniversary! Check out our funny puns! You would think this thing called love would get easier. Nope. Happy Anniversary! I feel like I’m the peanut butter to your jelly. We just go together well. Today we recognize and celebrate one of the greatest achievements of all time — your staying married to me for X years! Happiest of Anniversaries. Now if I can just remember your birthday too! Happy Anniversary. It would be hard to imagine a life without you — laundry, cooking and cleaning don’t just happen by themselves. Happy Anniversary! It started with a dream of a life together – and the dream just keep getting better (despite an occasional nightmare). Happy Anniversary. Mom and Dad: you two go together like green olives and martinis. Hip-hip-hurrah to the sweetest lovebirds I know! Congrats! “Leading by example” or “Do what we say, not what we do”: I can’t determine what line best fits your marriage instruction advice. All seriousness aside, congratulations on your X years of marriage. The secret of a happy marriage remains a secret. But, whatever you two are doing is working. Stay Happy and Happy Anniversary! I guess we can count among your master skills: marrying well and raising kids. Happy Anniversary from all of us kids — your masterpieces:)! If the nut doesn’t fall far from the tree, I’m expecting marrying the girl of my dreams and being married for X number of years! Thanks Mom and Pops! 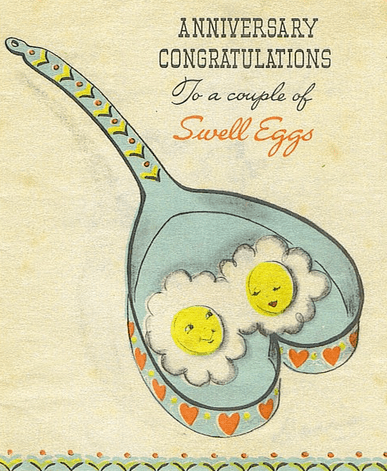 Congratulations to a couple of swell eggs! Love is like a war between two battling armies – easy to begin; but difficult to end. Happy Anniversary anyways! Don’t view your years of marriage as when time stood still, rather, thinking about it as the minutes flying by. Congrats on your big anniversary you two lovebirds! If love is blind, why is lingerie so popular. Happy Anniversary! X years of marriage! I have shoes older than that! No, really, happy anniversary. Defying the long odds, you two have stayed married for another year. Who would’ve guessed? Just kidding, hope you find time to celebrate in a big way! To say you two were meant for each other is a disservice to one of you. (You know who! Wink, wink). Happy Anniversary. Cupid’s arrow was a bullseye when you two came together. Happy Anniversary! To the hip couple who always seems connected at the hip – congrats! Sweet words, kind acts and the high cost of lawyers hold marriages together. Keep the good times rolling and happy anniversary! Tip: These funny anniversary wishes make great photo captions on social media! Love makes the world go round. You two must be dizzy! Congrats to the happy couple! Love will find a way. In your case, we thought it was the wrong direction. But, you proved us and the masses wrong. Congratulations on your wedding anniversary! You two seem to live by the old adage – love at first sight and every day afterwards. Have a great anniversary you charming pair! Cupid must have a great sense of humor to match you two up. Happy Anniversary! When he said, “I love you to the moon and back,” and you asked him to stop the Star Wars’ references, we didn’t think this marriage would last. Were we ever wrong! Congrats! Has it come to the point that a big anniversary night out is at Applebee’s? Splurge and enjoy yourselves this anniversary! Two words come to mind when I think of your anniversary: “Odd Couple” – no just kidding, “Perfect Pair”! The best I can say about this marriage is that misery loves company. Really – nothing could be further from the truth. You two are great together and deserve to celebrate! You know they say, “The course of true love never did run smooth,” and after knowing you two for some time, I have to agree. Nevertheless, it’s working on some level and for that you should be congratulated: just fooling, Happy Anniversary!